Preschool Playroom Magazine - renamed Preschool Friends magazine - is perfect for preschoolers and kindergarteners. Preschool Playroom Magazine features drawing , counting , coloring and reading activities , with a character poster and 6 page pull-out workbook in every issue. 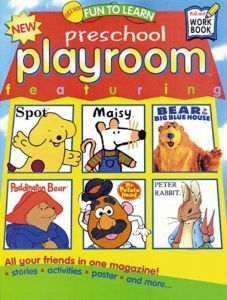 The Bear in The Big Blue House , Maisy , Mr. Potato Head , Spot , Peter Rabbit and Paddington Bear all make it Fun To Learn for children ages 2-5 while they learn colors , matching , spelling and more. There is also a "playroom pen pals" page to encourage children to write in or draw pictures of their favorite characters.